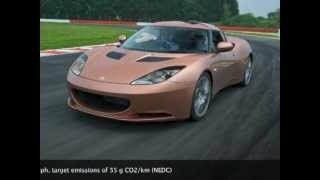 In the auto industry worldwide, Lotus is known for its performance oriented cars. But many consider the company to be one of the market leaders as far as development of new-generation of hybrid technology is concerned. For long, Lotus had been creating hybrid and electric technologies for use in the automobile industries for other companies. But in 2010 at the Geneva Motor Show, the company showcased a hybrid powertrain for one of its own models, theEvora 414E Hybrid concept. The 414E Evora had been fitted with a wide variety of hybrid technology in the car’s rear mounted engine bay. In fact the name 414E Hybrid comes from the car’s twin electric motors, which produces a combined peak power of 414 HP and drives the car’s rear wheel through a single-speed transmission that had been integrated into a single transmission housing. This gave the vehicle the capability to vector torque to each and either of its rear wheels in order to impart additional stability to the car. Each of the two electric motors of the Evora 414E Hybrid was capable of producing a peak torque of 295 lb-ft.
With all this power and torque, the Evora 414 E was capable of doing 60mph from zero in less than 4 seconds. The power to the electric motors came from lithium-polymer battery pack and once the battery starts to lose power, the 1.2 liter gasoline three-cylinder engine would get started and power both the car as well as the depleting lithium polymer battery. On a full charge of its battery, the car was able to go 35 miles and the battery could be charged even from a household power socket. 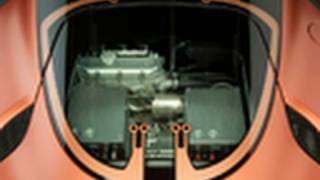 Another interesting feature of the car included the Lotus’ unique HALOsonic vehicle sound generators which increase pedestrian safety while reducing vehicle noise inside the cabin at the same time. The Lotus Evora 414E Hybrid concept showcases new developments in plug-in, range-extended electric propulsion, new electronic technologies to enhance driver involvement, the adaptability of the Lotus Versatile Vehicle Architecture (VVA) that underpins the Evora 414E Hybrid and a dramatic new roof system and interior concept from Lotus Design. The Lotus Evora 414E Hybrid structure is the same award-winning, versatile vehicle architecture used on the Lotus Evora. The low volume architecture was designed with the utmost flexibility in mind. Lotus Engineering has developed a highly efficient, high performance drivetrain system consisting of twin motors each limited to providing 152 kW (207 PS) of power and 400 Nm (295 lb/ft) of torque to each wheel via independent, single speed, reduction transmissions integrated into a single housing, enabling torque vectoring dynamic control of the vehicle (the capacity to generate different torques at each of the driving wheels), this is particularly suited to electric vehicles and significantly reduces the conflict between stability and response. 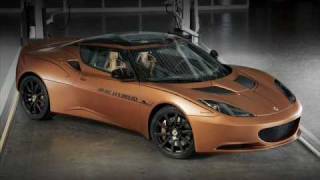 The Evora 414E Hybrid provides less of a psychological step change for people familiar with high performance cars compared to other electric and hybrid sports cars. The car has a simulated paddle shift gear change offering ultra quick gear changes reminiscent of a dual clutch transmission. This enhances the driver interaction with the vehicle and provides a driving experience similar to current internal combustion engine high performance sports cars. The Evora 414E Hybrid uses a column mounted paddle shift to simulate the gear change and a synthesised engine sound changes frequency with virtual gear selection. The drive torque is also modulated to simulate a physical feeling of a gearshift jolt. The virtual gearshift simulation, like a conventional gearbox, is used to change the driving characteristics and response of the vehicle. The most significant aspect that this offers the driver is the ability to control the vehicle deceleration by simulating engine braking through a virtual downshift in gears. Unlike true engine braking, the Lotus system does not dissipate the energy of the moving vehicle through internal engine friction but uses the electric motors to regenerate the energy back into the battery. While many electric and hybrid vehicles provide engine braking, this is generally at a fixed rate or pre-selected rate. In some driving situations this can either be too aggressive, slowing the vehicle unnecessarily, or too light, requiring additional braking application. The Lotus system effectively allows the driver to select the appropriate level of regeneration by simulating stepping down by one, two or even three gears. The simulation of engine braking through both the gear noise change and the retardation of the vehicle is fully intuitive to a driver familiar with a conventional gearbox. The simulated gear change capability can be selected for greater driving involvement or switched off for more relaxed driving. The distinctive colour scheme and 'floating' roof have been carefully designed to accentuate the cars electric vehicle technology whilst complementing the iconic lines of the Evora. Copper, a colour often associated with electrical systems, has been chosen for the car's exterior and interior. A contemporary satin finish paint is complemented by electrical circuit inspired graphics that highlight the car's key feature lines and the unique glazed roof panel. The newly extended glazed zone integrates seamlessly with the existing forms of the Evora whilst showcasing the key components behind the hybrid and electric vehicle technology. The signature copper theme is consistently carried throughout the car from the dramatic seat stripes and instrument panel inserts to the copper calipers that nestle behind the carbon grey forged wheels. Inside the cabin a sense of quality and richness has been created by carefully juxtaposing the different tactile qualities intrinsic to leather, Alcantara and metal. Through all of these aspects it ultimately demonstrates the exceptional ability of Lotus Engineering to integrate and develop advanced technologies for exciting, efficient, high performance niche vehicles. The vehicle energy storage system is made up of the latest Lithium Polymer battery chemistry providing 17 kWH energy storage capacity. The battery pack is optimised for energy density, efficiency and high power demand, with over 300 kW discharge capability. For everyday commuting journeys, up to 35 miles can be travelled using battery power. The battery can be charged overnight using a conventional domestic mains supply through a socket concealed by the rear number plate. This permits the vehicle to operate with zero tailpipe emissions. For longer journeys, exceeding the battery capacity, the highly efficient Lotus Range Extender engine is used as a generator to supply the motor with electrical power and top up the battery. 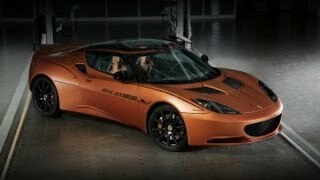 The cutaway hybrid Evora 414Evolution exhibit demonstrates Lotus Engineering’s technical expertise in: Lightweight Architectures, Efficient Performance, Driving Dynamics and Electrical and Electronic Integration. The new intelligent HALOsonic system is displayed in the cutaway hybrid Evora 414Evolution exhibit along with the supercharged production Lotus Range Extender. Lotus and HARMAN have created a next generation intelligent pedestrian warning system, integrating the advanced HALOsonic sound synthesis system with video technology. This cutting-edge enhanced version of the HALOsonic safety system incorporates input from imaging sensors to enhance the quality of the sound synthesis system. HALOsonic has been developed specifically for electric vehicles and hybrid electric vehicles. The system on this latest version of HALOsonic , a collaboration between HARMAN and Lotus uses a single camera to determine the distance, trajectory and speed of pedestrians and other road users, calculating the risk of collision by comparing this information with the car’s path. The new HALOsonic system uses this data to actively control the volume of the External Sound Synthesis to warn pedestrians of the vehicle’s location, thereby improving pedestrian safety and reducing noise pollution. Under certain conditions the system will generate an audible and visual warning for the driver using the Internal Sound Synthesis and instrument panel. The new active system is optimised to operate in urban environments where there is the greatest risk of a collision with a pedestrian. It is calibrated to actively control the volume and pitch of the sound synthesised while the vehicle is travelling from 0-75 km/h, continually evaluating the risk of a pedestrian collision and operating in an area up to 60 metres ahead of the vehicle. All of the HALOsonic systems are designed to use low levels of power and with the new active version there will be less power consumed as the system will only increase the volume when there is a risk of an impact. This innovative new active safety system is integrated into the HALOsonic range of products, which includes: External Sound Synthesis, Internal Sound Synthesis, Road Noise Cancellation and Engine Order Cancellation. The HALOsonic range has been designed by Lotus Engineering and HARMAN Automotive and offers a production ready technology as a stand-alone or integrated ICE system solution. Following is the list of recent pictures updates on our site.